This post contains affiliate links. If you make a purchase through one of these links, I make a small commission. What do you like to do for New Year’s Eve? Even before kids, we weren’t the partying type. We love to stay home, eat some delicious snacks, drink apple cider, and play card games and board games until well past midnight and into the New Year. We have continued this tradition for years with our kids, too. One thing at Christmas I always give to both my kids and husband are new games just for this reason. We are a hugely competitive family who LOVES to play games. This past week, we’ve stayed up most nights playing some of the new games I gave them. Though, Stranger Things Monopoly caused a bit of family drama when one of my teens was forced into bankruptcy over sky high rent on some property. My husband and I have always loved card games and board games, even when we were dating. So, I got him Bears vs. Babies , which we’ve been playing every night. It’s so much fun with attacking hordes of babies and crazy monsters you make. Even our 7 yr old can play by herself just fine. My husband discovered the explicit expansion pack, which I originally didn’t get since we play with the kids. He’s dying to play it with friends, so I just ordered it. My college age daughter has started playing card games with her group of friends at school. She told me they play way too much UNO and she needed to find a new game, so I got her Shifty Eyed Spies as one of her Christmas gifts. This is a game where you have to send sneaky signals to people. My husband took to it really fast and loved it, but it made me extremely self conscious until I finally figured out what I was doing. It’s a fun game and super quick to play. We only had 4 people, but I can imagine with up to 8 players, it’s a ton of fun. For younger kids, we also have a fun game – There’s a Yeti in my Spaghetti. This was one of my 7 yr old’s Christmas gifts. It’s similar to Kerplunk or Jenga where you lay the Yeti on top of the spaghetti and each person takes turns pulling a piece of spaghetti until the Yeti falls into the bowl. Want some more game ideas? You can check out some of our tried and true absolute favorite games we play as a family quite often, especially on New Year’s Eve. 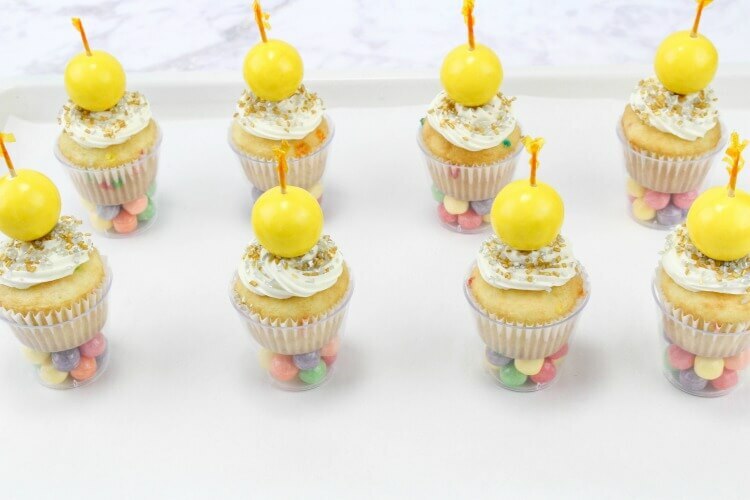 This recipe is made for 8 MINI cupcakes, but you can totally double, triple, or even quadruple it very easily. 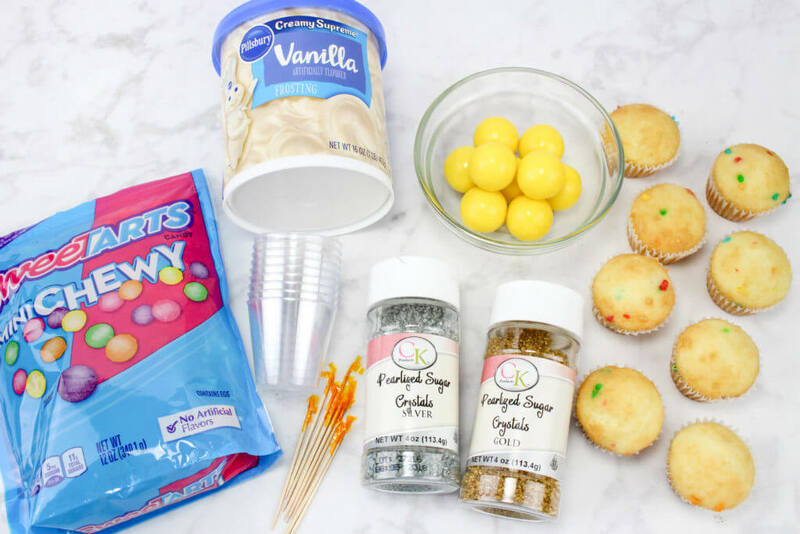 You could even skip making cupcakes and use those mini muffins in the packages – like the party ones with funfetti. Frost cupcakes in a swirl using a piping bag and star tip or just spread it on in a thick layer. Then, sprinkle gold and silver sugar all over the frosting. Pour some of the candy into each shot glass and fill almost halfway. 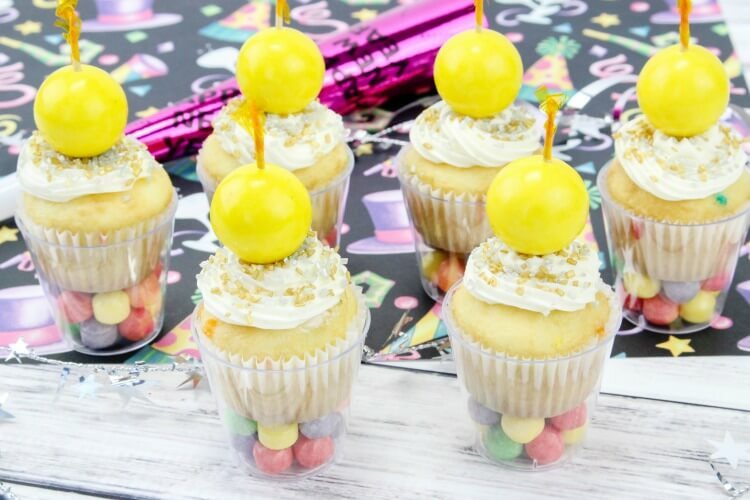 Place a cupcake into each glass. 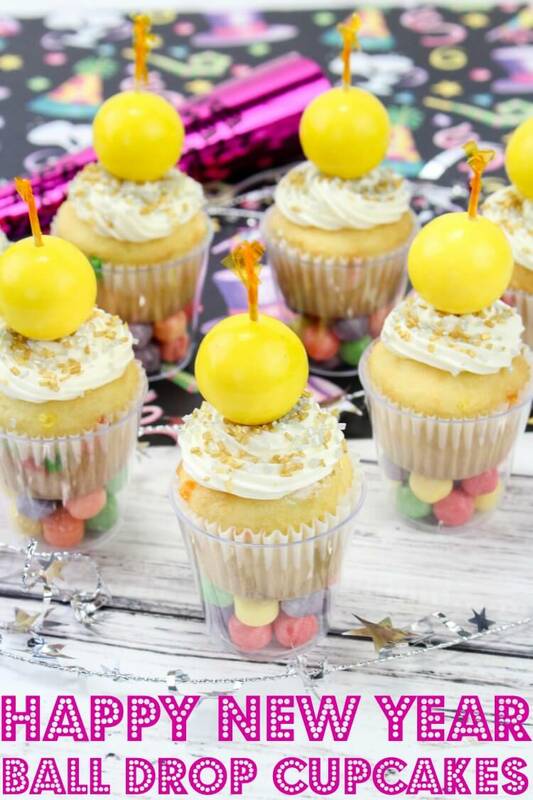 Poke a gumball onto each toothpick, and poke a toothpick down into the frosting on top each cupcake. 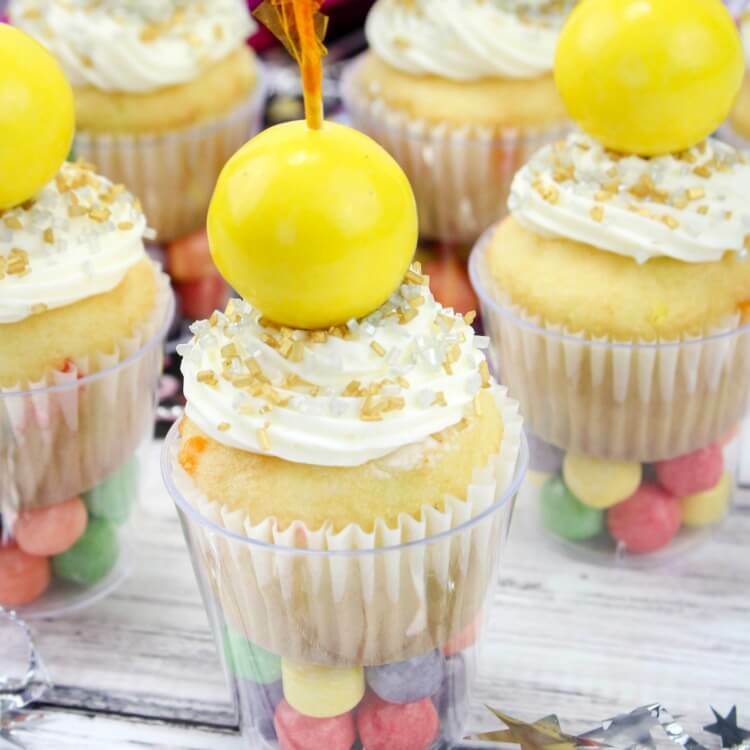 The ball can just rest on top the frosting. Frost cupcakes with swirls using a piping bag and star tip or just spread it on in a thick layer. 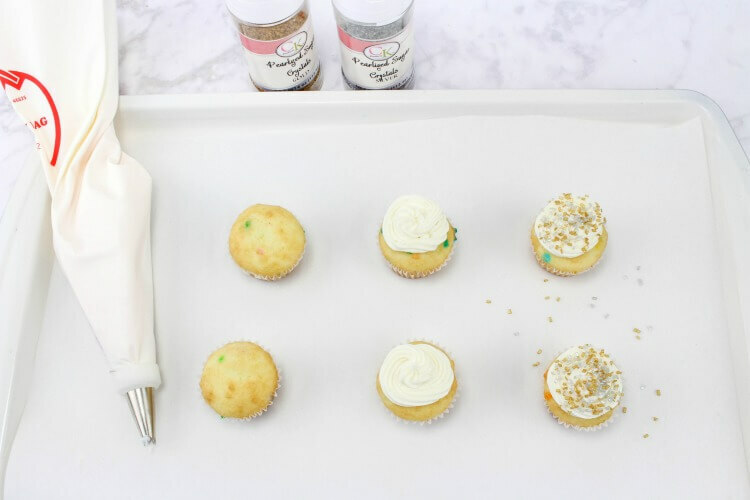 Sprinkle gold and silver sugar all over the frosting. Pour some of the candy into each shot glass and fill almost halfway. 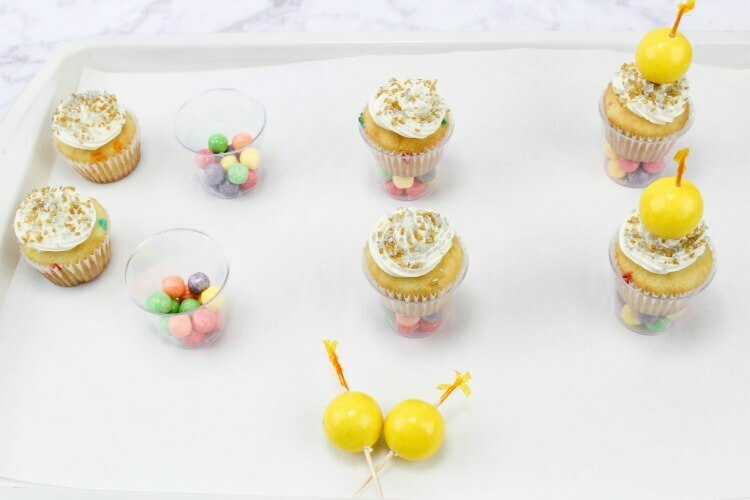 Place a cupcake into each glass. 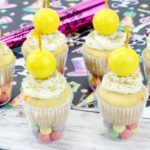 A fun little New Year’s Eve treat to serve!